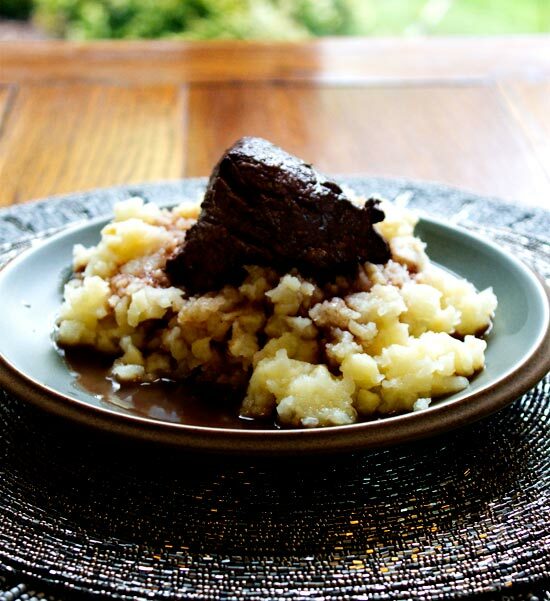 Fillet steak poached in Malbec wine on celeriac mash. 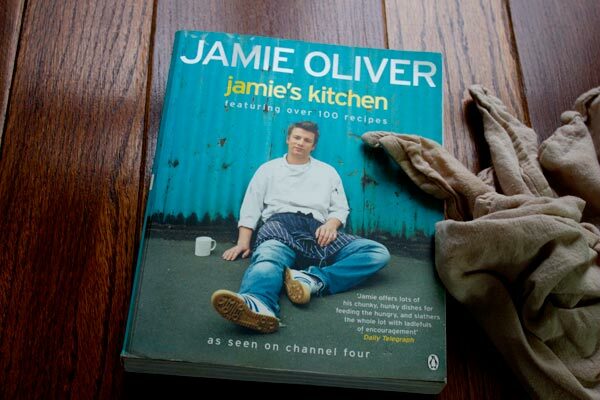 This is a Jamie Oliver recipe. 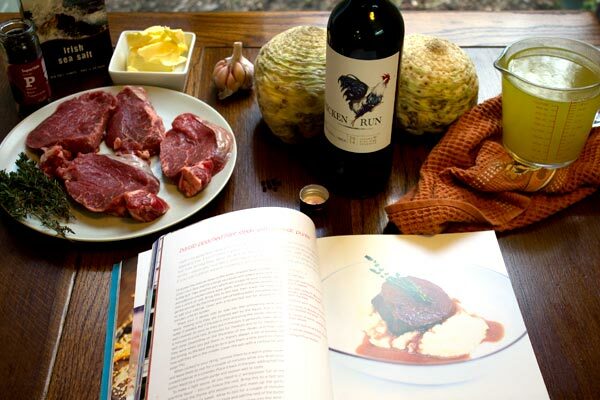 The title of this recipe in the book is Barolo Poached Fillet Steak with Celeriac Purée. Barolo is a full bodied rich red wine which costs around €40 a bottle. The recipe really shows you how little you have to do when you work with great ingredients. I did not use a Barolo – with my tendency to mess up recipes there was no way I was going to risk wasting half of a really good bottle of wine – instead I used a Malbec, Chicken Run Malbec. It costs between €10 – €15 and it’s a wine I like so I used it here. Did I mess up the recipe? Um, first time yes a little. I made two mistakes; the steaks were slightly too thin for the length of time I poached them and I didn’t simmer the stock and wine mix for long enough. You leave this to simmer away while cooking the celeriac. It still tasted good but it tastes much better with thicker steaks and a thicker sauce. And it really does taste great. So the point of the recipe is that poaching steaks in good wine is not a waste because ultimately the end result tastes great too. There is no denying this, but I have to admit that I usually use wine I wouldn’t drink in cooking and add things to it to give it the right taste. If you’re using top-quality steaks then definitely use a great wine. But let’s say you’re using some steaks packed in plastic from the fridge at the local supermarket. They’re perfectly good steaks but not as smooth in texture and taste as a top quality steak, then here is how to use that half bottle of red wine you’ve just rediscovered hiding in the door of your fridge at home – or how to use some paint-stripper bottle of wine that someone has given you or that you accidentally bought yourself – put the wine in a large jar or container with 2 – 4 tablespoons of honey (the more acidic the wine the more honey you put in), if it’s lacking body add a tiny bit of crude molasses too, add 4 peeled and bruised garlic cloves, a quarter nutmeg nut, some pepper corns and whatever herbs or spices you’re adding to final dish. Stir this mix around well, cover and leave it on the counter-top overnight. The next day pour it through a sieve, discard all the stuff in the sieve, and you’ve got something you can use for cooking that will tenderize meat and taste good. You’ll probably need to add a bit of tomato purée to the dish as well. But if you have a great red wine and great steaks then this is definitely the recipe to go with. And if you make it for 2 rather than 4 you’ll still have a 3/4 bottle of good wine to enjoy it with – just use a smaller saucepan that holds two steaks snugly. 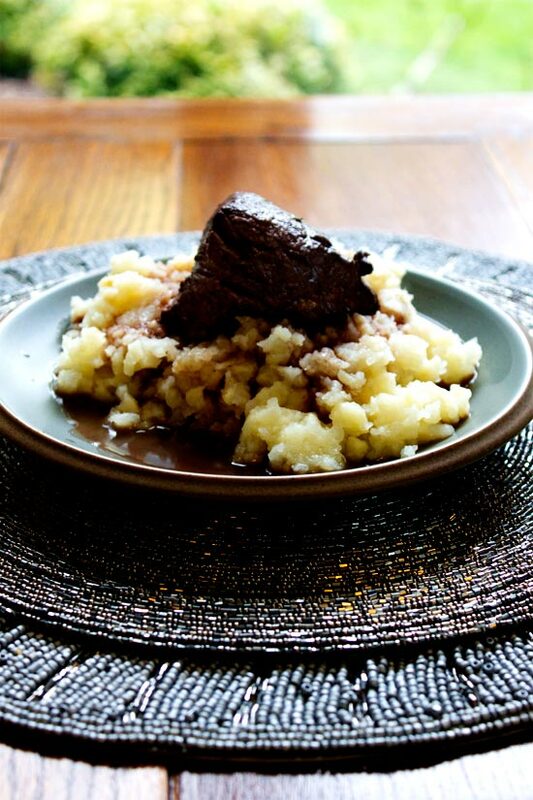 Fillets steaks, a nice bottle of red, chicken stock, butter, celeriacs, peppercorns, thyme, salt, pepper and garlic. Peel the celeriac down to the white, smooth flesh. Cut into 2 cm/1 inch dice. Half fill a large saucepan with salted water and bring to the boil. Take another pan that will snugly fit your four steaks later, and add the wine, chicken stock, garlic, thyme, peppercorns and a good pinch of salt. Bring to the boil and reduce the heat to simmer. Add the celeriac to the now boiling salted water. Cover and leave to boil away on the high heat for around 15 - 20 minutes until tender. Then drain and mash. Add the steaks to simmering stock/wine liquor. Cover with a cartouche (it's a round bit of baking paper - or you can just use the wrapper of a stick of butter with the corners chopped off) and leave to simmer till the steaks are cooked to your liking. It generally takes about 6 minutes for rare, 8 minutes for medium and 10 for well done. When the steaks are done remove from the pan to a warm plate and cover. You only need two wineglasses full of the poaching liquor to make your sauce. You can pour the rest into a container and freeze for future use. Bring the two glasses of the poaching liquor and half the butter to the boil fast, then remove the thyme and peppercorn, and mash in the garlic. Allow to boil for a couple of minutes. Remove from the heat and, season to taste and add the rest of the butter. Shake the pan lightly so the melted butter dissolves into the wine - this will make a shiny lightly thickened sauce. Do not reboil as it will split. It looks like a lot of mash and a lot of sauce but actually it’s a small plate. OK there was definitely a lot of sauce. But I like it like that.